On December 13th 2014 I had my first open house style art show. I wanted to show my friends and neighbors what I've been busy creating, and this provided the perfect opportunity. It was just in time for the holidays and a great time to network. I provided lots of sugary baked goods and some wine while Queen and Bowie music videos played in the background. 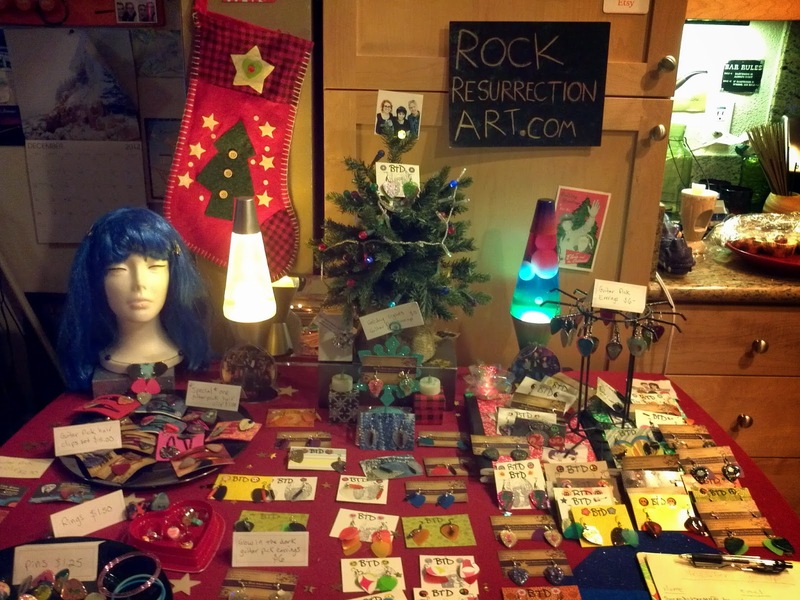 The ambiance was rock n roll as usual with a bit of Christmas and psychedelia. 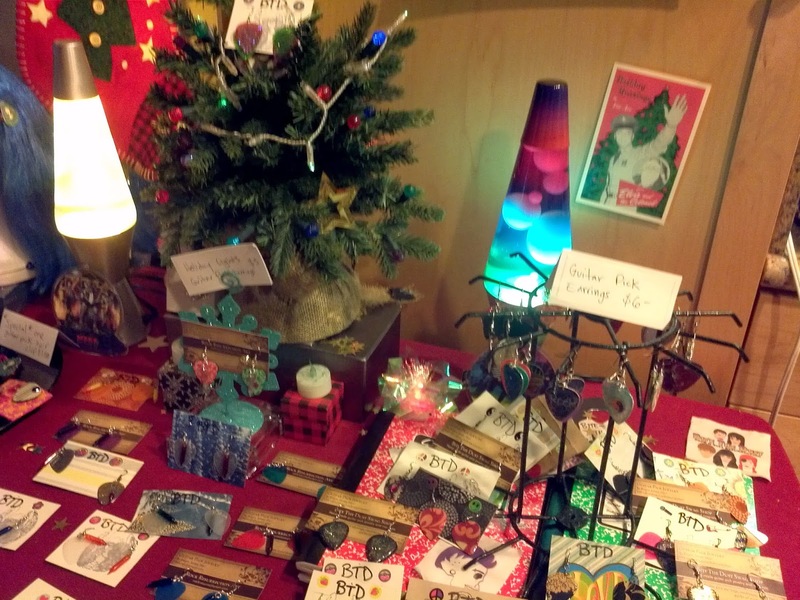 My main display was built around a tiny Christmas tree and lava lamps. I debuted what I call my "David Bowie series" of Bowie inspired guitar pick earrings. They feature loads of glitter and Ziggy style lightning bolts. Lately pins and clips have been popular sellers, so I made sure to set up some of the David Bowie clips and rings. I had three displays set up in the living room. Holiday lights guitar pick earrings are popular during the Christmas season too. I showcased classic red and green pairs with my brand new colorful holiday lights earrigs. 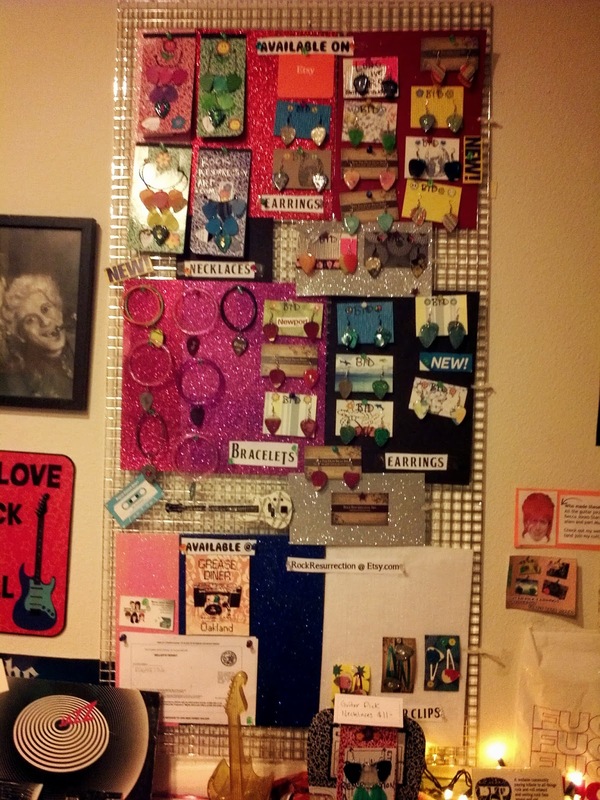 Other items shown that night: glow in the dark guitar pick earrings, suncatcher bead earrings, guitar pick necklaces, guitar pick hair clips, candy rings, guitar pick rings, bracelets, and re-vamped brooches. These items are available in my Etsy shop.